Are you thinking of purchasing outdoor umbrellas on the Gold Coast for business use? Sure, you can head to your local hardware retailer but bear in mind that the products you’ll find there won’t be suitable for commercial purposes. For business purposes, you need to invest in high quality outdoor umbrellas, such as those we offer here at Global Shade. Global Shade outdoor umbrellas are widely used by many businesses on the Gold Coast. This is because our products are far superior to those that you’ll find elsewhere. Continue reading this article as I list out the 7 types of outdoor umbrellas that we offer. You can choose any one of these depending on your requirements. If you own a café, restaurant or any other similar business on the Gold Coast, then our Portable Range of outdoor umbrellas are perfect for you. These retractable umbrellas are lightweight, require little maintenance and can easily be installed into sockets or base plates. Our Portable outdoor umbrellas offer excellent UVR protection and can withstand wind speeds of up to 60kph. We offer these outdoor umbrellas in a range of colour options and you can even customise them to include your corporate branding. If you’re looking for heavy-duty outdoor umbrellas on the Gold Coast, our Horizon Range umbrellas are what you need. These umbrellas are non-retractable, square shaped and engineered to withstand the harshest weather conditions. Our Horizon umbrellas are UV treated and heat reflective, require low maintenance, and can withstand wind speeds of up to 118kph. These umbrellas are perfect for use in hotels, resorts, swimming pools and other similar commercial applications. You can even customise our umbrellas to include lighting, heating, curtains and other accessories. We also offer screen printing for branding and link panels for you to join our umbrellas together. For commercial outdoor umbrellas on the Gold Coast of the highest grade of quality, choose Global Shade’s Sunset Range. These umbrellas feature superior strength, durability and are incredibly elegant as well. Our Sunset umbrellas are suitable for use in resorts, hotels and cafes where they may need to be retracted quickly. Available in rectangular, square and hexagonal shapes, our Sunset umbrellas are UV treated, heat reflective and easy to maintain. These umbrellas can easily withstand heavy winds of up to 118kph. AS with our Horizon range of umbrellas, you can also customise our Sunset umbrellas as well. If you own a business on the Gold Coast, you need outdoor umbrellas that are highly stable and durable. In this regard, our Typhoon Range of outdoor umbrellas are absolutely perfect. Rated to withstand winds of up to 148kph, our industry leading umbrellas will perfectly meet your requirements. Translucent, UV treated and heat reflective, these umbrellas feature top grade of workmanship and are easy to maintain. Global Shade can even customise these umbrellas with a range of accessories for you. If you’re looking for cantilever umbrellas for your outdoor swimming pool or resort, our Vista umbrellas are ideal. These retractable umbrellas can be pivoted 360° and can provide shade to more than one area. We offer our Vista outdoor umbrellas in hexagonal, square and rectangular shapes. Our low maintenance umbrellas are UV treated, heat reflective and designed to withstand winds of up to 122kph. You can customise these umbrellas to meet your branding requirements as well. For umbrellas that can be opened or retracted quickly, choose our Panorama Range of outdoor umbrellas on the Gold Coast. These umbrellas are suitable for use in hotels, restaurants, cafes and restaurants. Global Shade Panorama umbrellas are manufactured to the finest standards of quality and require little maintenance. These UV treated umbrellas are also heat reflective to provide maximum comfort. Rated to withstand wind speeds of up to 118kph, we’ll also customise these umbrellas to suit your requirements. Global Shade Hypar Range of outdoor umbrellas are incredibly popular with designers and architects on the Gold Coast. A brilliant alternative to classic outdoor umbrellas, our Hypar umbrellas are extensively used in shopping centres, commercial precincts and other public spaces. Available in square shapes, we can design these umbrellas for continuous connection to cover pathways and walkways. These non-retractable umbrellas can withstand winds of up to 148kph and are available in many colour options. We can screen print and customise these umbrellas to various include accessories as per your requirements. If you’re looking for outdoor umbrellas on the Gold Coast for use in commercial applications, you must invest in superior quality products. At Global Shade, we have just the solution for you. 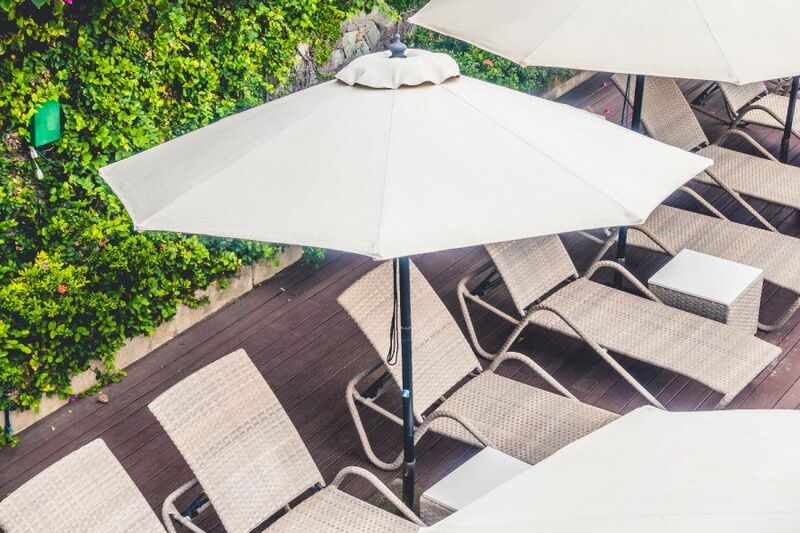 Our outdoor umbrellas on the Gold Coast include Portable Range, Horizon Range, Sunset Range, Typhoon Range, Vista Range, Panorama Range and Hypar Range. All of these are top quality products that are specifically designed to suit commercial applications. To know more about our range of outdoor umbrellas, please feel free to get in touch with us. Simply call us at 1800 724 407 or drop us an email at info@globalshade.com.au. We’ll be happy to provide you all the information you need.